The Basic Program is a five year study program launched at Amitabha Buddhist Centre (ABC), an affiliate of the FPMT1, in August 2003 at the request of its spiritual director, Lama Zopa Rinpoche. This program, contrary to its name, was intended for serious students who were prepared to commit themselves to this demanding course. It is “basic” insofar as the syllabus has been conceived by Rinpoche to ensure that senior students, at the very least, have studied these essential texts he had personally selected. ABC was able to launch this program because of the arrival on 25th October 1999 of its new resident teacher, Khen Rinpoche Geshe Thubten Chonyi. Small in stature, humble in demeanour, Khen Rinpoche’s appearance gave very little sign of his formidable scholastic reputation at Sera Je Monastic University, where he studied from the age of 18, until he emerged as the first Lharampa Geshe from Kopan Monastery (FPMT’s mother monastery in Nepal). Rinpoche said Khen Rinpoche was reputed at Sera Je as being someone who “has known” the Dharma, is widely respected for his exemplary behaviour and conduct and whose knowledge is like the mountain. ABC is therefore very, very fortunate indeed to be under the care and guidance of an exceptionally well-qualified teacher. Over the years, Khen Rinpoche has become father and mother, counselor, confidante, mentor, coach and the most perfect of spiritual guides and virtuous friends to countless ABC students as well as to many other devotees who come to consult him. 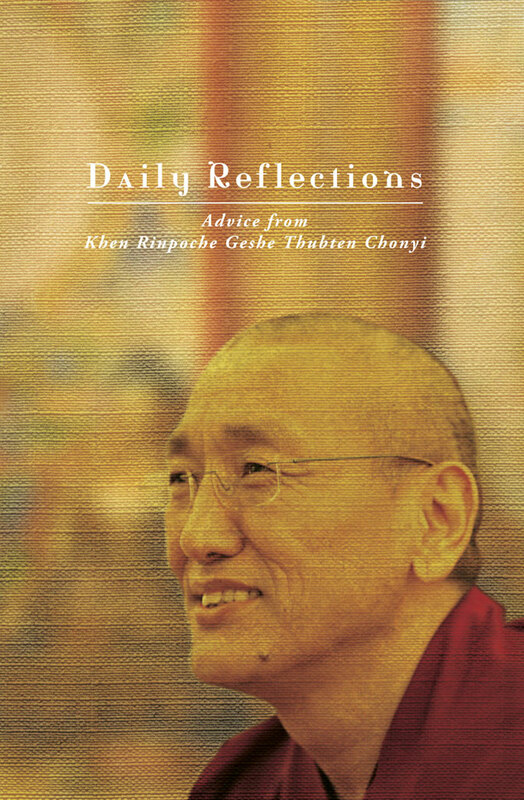 This book then is a compilation of Khen Rinpoche’s opening remarks and motivations at the beginning of lessons offered in Modules 5 – 9 of the Basic Program3 to commemorate the eighth anniversary of Khen Rinpoche’s arrival in Singapore. These teachings offer valuable advice related to our Dharma studies and practice: how to check whether our practices are Dharma, the need for study and constant reflection on the Buddha’s teachings, and how to overcome our afflictions and problems so that we can truly benefit others. In Singapore, we all lead very busy and stressful lives, juggling personal, family and work commitments and it can be hard to make time to attend Dharma teachings. There is much food for thought contained in this compilation. So wherever you are - commuting on public transport, waiting for a friend at an appointment, between meetings – pull out this book and take a little sip of the Dharma. We would like to take this opportunity to thank Ven. Tenzin Gyurme, who is our Basic Program translator, Cindy Cheng who first prompted her husband, Phuah Soon Ek, to transcribe the Basic Program teachings, Fiona O’Shaughnessy who spear-headed the editing of the transcripts, Yap Siew Kee, Tara Hasnain and Cecilia Tsong who helped with proof-reading and the team of transcribers led by Phuah – Vivien Ng, Angie Xiao, Tok Sock Ling, Cheng Tien Yit and Alison Wong. The transcripts were further prepared for this compilation by Cecilia Tsong. We would also like to thank Lim Cheng Cheng and Tara Hasnain for their invaluable input and editorial suggestions. May whatever merit is generated by publishing this book be dedicated to the long life and good health of our precious teachers, especially His Holiness the Dalai Lama, Lama Zopa Rinpoche and Khen Rinpoche Geshe Thubten Chonyi as well as to the immediate fulfilment of all their holy wishes. May the Buddha’s teachings, especially the stainless teachings of Lama Tsongkhapa, flourish in the ten directions, and may Amitabha Buddhist Centre be free of all obstacles in spreading the holy Buddhadharma in Singapore exactly according to the wishes of Lama Zopa Rinpoche. Khen Rinpoche Geshe Chonyi has been the resident teacher of Amitabha Buddhist Centre since October 1999. He was born in Nepal in 1962 and was ordained by Kyabje Lama Zopa Rinpoche in 1974 at the age of twelve. Khen Rinpoche holds a Geshe Lharampa degree, which is the highest Tibetan Buddhist doctorate awarded to monks from Sera Je Monastic University. This degree requires at least 20 years of intensive study and debate and only the most outstanding students qualify to sit for the exams. After graduating as a geshe in 1997, Khen Rinpoche joined the prestigious Gyurme Tantric College for a year to further his studies on tantric Buddhism. He was awarded first position in his group for the highest Tantric Ngarampa (Master of Tantra) degree. He then returned to Kopan Monastery where he taught Buddhist philosophy. 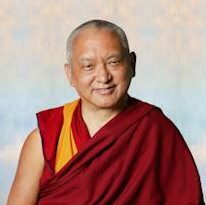 With the support of Lama Zopa Rinpoche and the late Khensur Rinpoche Lama Lhundrup (then abbot of Kopan Monastery), Khen Rinpoche started teaching the five-year Basic Program at ABC in August 2003. This first cycle of the Basic Program was completed in September 2009 with over 25 students graduating from this cohort. Khen Rinpoche was then requested and kindly agreed to teach another cycle of the Basic Program for new students at ABC. The second cycle of the Basic Program began in June 2011. In July 2011, Khen Rinpoche was appointed abbot of Kopan Monastery, in addition to his duties as the centre’s resident teacher. Besides being perfectly qualified to teach such a study program, Khen Rinpoche is also renowned for his ability in developing the students’ analytical skills through discussions, debate and written assignments. Khen Rinpoche is held in great esteem for his illustrious conduct, vast learning and great kindness, wisdom and compassion. Daily Reflections is available as an ebook from online vendors; see links on the Lama Yeshe Wisdom Archive website. Originally published in 2007 for free distribution by Amitabha Buddhist Centre, Singapore. Published as an ebook in 2014 in partnership with Lama Yeshe Wisdom Archive. We all lead very busy and stressful lives, juggling personal, family and work commitments and it can be hard to make time to attend Dharma teachings. There is much food for thought contained in this compilation. So wherever you are--commuting on public transport, waiting for a friend at an appointment, between meetings--pull out this book and take a little sip of the Dharma. The preceding is, briefly, an explanation of the reasons for meditation and a description of the path up to the buddha stage. If we really want to practise the Buddhist Dharma, we must first know what suffering is and realize the way in which we exist in samsara. To get out of samsara, we must have strong faith in the Buddha, and then practise as the Buddha taught. We should consider how other beings are also suffering in samsara, and out of compassion for them, we must wish to reach the buddha stage in order to help them. It is important to try to find the right understanding of Dharma. Even if we buy a watch, which only needs to last for a few years, we try to find a good one. Because Dharma is not just for ourselves in this life, but for all beings in all lives, it is much more important to find the right and best understanding of it. If we want to trust another person, first we have to know that the other person is honest and reliable; we can only determine this by what the other one says or does. In the same way, we can have faith in the Buddha only by knowing what he taught, by looking at our experiences to see whether it is reasonable, and by practising it to see if it gives good fruit or not. Then our faith will be indestructible. The terms are given first in English, followed by the Sanskrit and Tibetan equivalents. The syllables in brackets provide a phonetic Tibetan pronunciation. Diacritical marks have not been used on Sanskrit letters. The explanations are intended only to expand briefly on the use of the term in this text. For exact transliteration and for more general definitions and a wider range of applications, the reader is referred to the glossaries of other publications concerning the sutra path in Buddhism, as well as to such dictionaries as Monier-Williams' A Sanskrit-English Dictionary, and Chandra Das' Tibetan-English Dictionary. The four noble truths; caturaryasatya; bden.pa bzhi (den.pa zhi). Suffering due to suffering; suffering of misery; duhkha duhkhata; sdug.bsngalgy sdug.bsngal (dug.ngal gyi dug.ngal). Suffering due to change; viparinama duhkhata; ’gyur.bai sdug.bsngal (gyur.wei dug.ngal). All embracing suffering due to mental formations; suffering of being conditioned; samskara duhkhata; khyab.pai 'dus.byed gyi sdug.bsngal (khyab.pai du.je gyi dug.ngal). Volitional action of body, speech and mind; karma; las (ley). The Sanskrit term karma is generally used. Karma is of three types: skillful, unskillful, and neutral. Mental defilement; klesha; nyon.mongs (nyon.mong). There are two forms of mental defilements: harmful inclinations, and the mistaking of the way things appear to exist for the way they actually do. (Literally) circle or sphere; mandala; dkyil. 'khor (kyil.kor). The Sanskrit term mandala is used most often. A mandala can be the physical circular object used for making offerings, the symbolic universe that is being offered, or the special abode or environment of the one who is receiving the offering. The intermediate state between one's death and one's next rebirth; antarabhava; bar.do (bardo). Ignorance; mental darkness; moha; gti.mug (ti.mug). These three comprise the three poisons. Ignorance regarding the self of phenomena; dharmatmadrishti; cho.kyi dag.dzin gyi ma.rig.pa). Carrying; vehicle; yana; theg.pa (teg.pa). The mind motivated or dedicated to achieve enlightenment for the sake of all living beings; the altruistic intention; the awakening mind; bodhicitta; byang.chub kyi sems (jang.chub kyi sem). Wisdom; prajna; shes.rab (she.rab). Method; means; upaya; thabs (tab). Buddha field; buddha kshetra; sangs.rgyas kyi zhing (sang.gye kye zhing). Ten levels or grounds; dashabhumi; sa.bcu (sa.chu). "The Oceans of Clouds of Praises"; stod.sprin rgya.mtsho (do.trin gya.tso). This is a prayer in praise of the bodhisattva Manjushri, which contains a description of a buddha's qualities of body, speech and mind. Perfection; paramita; pha.rol tu phyin.pa (pa.rol tu chin.pa). 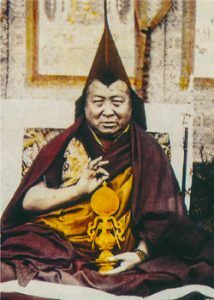 Lha Lama Yeshe Ö; (Devaguru Jnanaprabha). This king was a descendant of King Langdarma (gLan-dar-ma), who was responsible for eradicating the first spreading of Buddhism in Tibet. Verses 19 and 20 of Je Tsongkhapa's prayer The Beginning and the End (thog.mtha.ma (tog.ta ma)). Calm abiding; shamatha; zhi-gnas (zhi.nay). Calm abiding is the perfection of mental concentration. Analytical, or investigative, meditation; vicharabhavana; dpyad.sgom (je.gom). Discursive analysis of the true nature of the meditation object. Concentration meditation; sthapyabhavana; 'jog.sgom (jo.gom). Following discriminating or analytic meditation, one then single-pointedly places the mind on the meditation object. This practice is an aspect of calm abiding. Diamond posture; vajrasana; rdo.rje.gdan (dor.je den). This asana is called the diamond posture or pose because in this position, one can sit firmly, "indestructibly," unmovingly, for a long period of time. Scattered attention; agitation; mental excitement; auddhyata; rgod.pa (go.pu). Torpor; sinking; lethargy; nirmagnata; bying.ba (jing.wa). Mindfulness; remembrance; recollection; smrti; dran.pa (den.pa). Clear comprehension; awareness; mental spy; samprajdnya; shes.bzhin (she.zlzin). Subtle torpor; sukshmanirmagnata; byin.ba phra.mo (jing.wa tra.mo). Insight meditation; heightened insight; vipashyana; Ihag.mthon (Ihag.thong). This perfection is divided into four categories: the giving of property, Dharma, refuge, and active love (maitri). The giving of property-- For most of us, basic material needs such as food and clothing are the types of property easiest to give. High bodhisattvas, however, are capable of giving their eyes, flesh, and even their lives. The object we give is not the actual giving—it is only the means for giving. The real activity of giving is the strong decision to give freely, without avarice. In this way, even if we possess nothing, we can practice giving, because giving depends on our state of mind, not on the object being given. Milarepa had only a small cloth to wear and lived on nettles, but he still practiced the ultimate perfection of giving. In the beginning when we try to start this practice, we may find that even the giving of money or material things is difficult, but when we have completed the perfection of giving, the giving of anything, even our own flesh, will be easy. To practice the perfection we need a very strong desire to help others and a very strong will. But if our motive for giving property is to gain fame, for instance, this is not the practice of giving at all. The giving of Dharma-- The giving of Dharma means that one gives, with pure mind, the true teaching to other beings. This type of giving is more beneficial than the giving of property. Possession of property helps for only a limited time, while Dharma is lasting and more deeply helpful. A person with property may still be suffering, but Dharma can not only remove this suffering, it gives the person a new wisdom eye as well. Included in the bodhisattvas' work to attain buddhahood is the aim to give Dharma as fully as possible to all beings. The giving of refuge-- To give refuge means that we work to save and protect the lives of all living beings. For instance, if we put water creatures stuck in the mud back into water, we are practicing this kind of giving. The person who truly wants to put an end to war and killing is practicing the refuge aspect of this perfection. If the life of any being is in danger, we have to help in any way we can. The practice of giving refuge results in very good fruit immediately and deeply. The giving of active love--The practice of active love is the wish to give real happiness to all beings. By just having this wish, we cannot directly help beings straight away, but if it is cultivated it will eventually have great results. The immediate fruit of this practice is that no spirits can harm the practitioner.All these kinds of giving help in two ways—they help other beings and they help ourselves. If we practice giving solely for our own benefit, it is not true giving. The first aspect is the protection of our body, speech and mind from performing unskillful deeds. We have the tendency to act unskillfully, and this tendency needs to be controlled. We protect ourselves from acting this way when we stop using our body, speech and mind in harmful ways. We can think of our body, speech and mind as three naughty children, and of ourselves as their parent trying to keep them occupied in a room. Immediately outside the door of the room is a dangerous precipice, which represents the harmful things to which the children are attracted. Whenever they try to run out of the room, we have to pull them back inside to safety. If we let our body, speech and mind go as they will, we shall experience much suffering in the future. This protection of body, speech and mind is the first aspect of morality. The second aspect is to protect others in the same way as we protect ourselves. For instance, when someone is about to kill an animal and we demonstrate that it is wrong to do so, we are protecting that person from committing harmful actions. When we perform any skillful deed, this automatically protects us from performing any unskillful ones. This substitution of skilful action in the place of unskilful is the third aspect of the perfection of morality. Patience when we are harmed by others. When we are harmed bodily or mentally by others we should not react by getting angry or harming them in return. and, avoiding anger, speak instead of their good qualities. may I quickly bestow supreme buddhahood on them! The harm given us by the body, speech or mind of others is like a sword, arrow or spear. The practice of patience is the good armor of protection against this; possessing it, we cannot be injured. If we do not practise patience, trying instead merely to avoid conflict and say nice things and be friendly to everyone, we shall be unable to behave like this to all the countless beings, but with patience we shall be constantly protected from harm. If we walk along a very rocky path, it is impossible to remove all the stones from the way, but strong shoes protect us from all possible injuries. The patience of keeping concentration. The third kind of patience is that of keeping concentration on meditation, or anything else concerned with Dharma, without allowing distracting influences to harm the practice. The first is the energy of the mind that stops the desire for unprofitable things. If we have a strong desire for ordinary things disconnected from Dharma, it disrupts our Dharma practice. Although we have to do everyday things, if our fondness for them is greater than our fondness for Dharma, our attention is taken away from our main work. A person may concentrate and work very hard, but if the goal of all that effort is a worldly one, then, according to Dharma, that person is lazy. People who really want to practice Dharma are in a hurry even when eating or excreting, so as not to waste time. Energy for worldly things is weakness; energy for Dharma is real strength. This aspect of the perfection of energy speeds us quickly towards the final goal. Having energy for Dharma practice, the real purpose of life, prevents our being distracted by worldly goals. It protects us from all kinds of bad things. The second kind of energy protects us against tiredness. For instance, a meditator who suffers from such tiredness that even the mere sight of the meditation place brings on sleep, overcomes this weakness by this kind of energy. One way to stop this fault is to consider the fruit of meditation or Dharma practice; if we bear this in mind, bodily tiredness does not make us lose our energy. People at work do not suffer very much from tiredness because they are thinking of the money they will get. If we consider the great fruit of practising Dharma wt will work hard at it. High lamas living in the mountains with very little food and sleep are not tired and complaining; rather they are very happy, because they see that the fruit of their work is near. These lamas have many different ways of practising Dharma: some are always teaching; others live alone in the mountains and accept perhaps one or two pupils. The third kind of energy is the confidence that we are not too small, weak or stupid to obtain the fruit of Dharma practice. Weakness of this kind stands in the way of achievement of the object. It can be overcome by thinking that the highest buddhas and bodhisattvas also once had only delusion, lived in samsara, and were worse than ourselves. By practising Dharma, they reached the highest stages of perfection; we can do the same. No one has perfect virtue from the beginning; when children first go to school they cannot even read or write, but later they learn to do not only that but many other things as well, and some become great scholars. The Buddha said that even insects living in excrement can become buddhas. If we bear all this in mind, we shall find no reason why we cannot practise Dharma. The three kinds of energy overcome three weaknesses: the first that the mind will not turn to Dharma; the second is the fatigue we experience when we practise; the third is the doubt we have in our own ability to achieve the aims of Dharma. The person who wants to get to the top of a mountain has first to turn to the path, second, to keep going and not give in to laziness, and third, not to falter and think, "This is possible for strong people, but not for me. The scriptures teach that all virtue follows from energy. With energy, someone who is not intelligent can get the Dharma fruit. A person who is intelligent but lazy will not get the fruit, and the intelligence is useless and wasted. With both intelligence and energy, there will be the greatest success. There is a simile in the scriptures that if the dry grass on a mountain catches fire and the wind fans it, the whole mountainside will catch fire, but if there is no wind the fire will go out straight away. Intelligence is like the fire and energy like the wind. If a person has intelligence and no energy, nothing will be accomplished. Thus the perfection of energy is essential for achieving the goal. Concentration must be on an object. It is very important in both Dharma practice and ordinary life. The Tibetan word for concentration meditation is zhi.nay; nay means to "dwell" or "stay," and zhi means "in peace." In a practical sense, then, zhi.nay means to live peacefully without busy-ness, and is often translated as "calm abiding." 20 If we do not examine it carefully, our mind seems quite peaceful; but if we really look inside, it is not peaceful at all. Our mind is not able to stay on the same object for a second. It flutters around like a banner in the wind; as soon as we concentrate on one thing, another comes to disturb it. Even if we are living on a high mountain or in a quiet room or cave, our mind is always moving. If we go up to the top of a high building in a busy city we can look down and see how much turmoil there is, but when we are moving around within the crowd, we are only aware of a little of the bustle. Among the various mental factors, there is constant movement between conflicting elements; these factors always lead the mind. The movement of a banner fluttering in the wind Is not caused by the banner itself but by the wind. Mind is like the banner and the mental factors are like the wind. This constant movement stops the mind concentrating on an object for long. Of our mental factors, the defilements are stronger than the good qualities. We usually do Dot try to control them, and even when we do, it is very difficult because for a long time we have been in the habit of always following them. Concentration or calm abiding occurs when our mental factors are purified and thus our mind is able to dwell peacefully on the object. There are two kinds of meditation: analytical meditation 21 and concentration meditation. 22 It is necessary to use both kinds of meditation to remove delusion and reach the goal. Some people say that thinking and learning about Dharma are not meditation, but the scriptures say that these activities are in fact also kinds of meditation. If we do not think carefully and know the nature of the object we cannot concentrate well. The bustle within the mind is mind-produced; to quiet it, therefore, action by the mind itself and nothing external is required. The primary action must be by the mind; on this basis, factors such as a suitable place and the meditation posture can help. If it is not painful, the vajra posture, 23 with the legs crossed and the feet resting upturned on the thighs is best. However, if sitting in this position causes pain and distracts the mind, the left foot should be tucked under the right thigh and the right foot should rest on the left thigh. The trunk must be as straight and erect as possible. The arms should be in a bow shape, not resting against the sides of the body or pushed back; they should be at rest but firm. The back of the right hand should rest in the palm of the left; the thumbs should be level with the navel. The neck should be curved slightly forward, with the chin in. The eyes should be focused straight along the sides of the nose. The mouth and lips should be relaxed, neither open nor tightly shut. The tongue should be pressed gently against the palate. These are the seven aspects of the vajra posture. Each is symbolic of a different stage of the path, but each also has a practical purpose. The legs crossed and the feet on the thighs make a locked position. We can lock ourselves firmly in place with legs crossed and the feet on the thighs as described above; positioned like this we could sit in meditation for a long time, even for months, without falling. The straightness of the body allows for the best functioning of the channels carrying the airs on which the mind rides in our bodies. If the body is straight these channels will not be blocked. The position of the arms is also to allow the best functioning of these channels. If one looks too high one can easily see something distracting; if the head is too low one gets pain in the neck or becomes sleepy. The mouth should not be closed so tightly that breathing is difficult if the nose is at all blocked; nor should it be open so widely that strong breathing causes the fire element of the body to increase with high blood pressure resulting. If the tongue is pressed against the palate, the throat and mouth will be kept moist. These are the immediate reasons for the meditation posture. Very rarely, people's arrangement of the inner channels is different, in which case they need a different position. By just sitting in the vajra posture we achieve a good frame of mind, but the main work has to be done by the mind itself. If a thief enters a room, the way to remove him is to go in and throw him out, not just to shout from the outside. Similarly, if we are sitting on the top of the mountain while our mind is wandering in the village below, we shall not be able to develop concentration. There are two enemies of concentration. One is busy-ness, wildness, or scattered attention; 24 the other is sleepiness, torpor, or sinking. 25 Our attention is distracted when a desire arises and the mind immediately races after it. Whenever the mind goes after anything other than the object of concentration, this is wild or scattered, mind. Sleepiness, or torpor, occurs when the mind is sleepy and not alert. If we want to concentrate well, we have to overcome these disturbances. If there is a beautiful picture on the wall of a dark room, we need a candle to see it, but if there is a draught, the flame will flicker and we shall not be able to see it properly. If there is no draught but the flame is very weak, there will not be enough light and we shall still not be able to see the picture. If there are neither of these difficulties, the flame will be strong and steady and we shall be able to see the picture clearly. The picture is like the object of concentration, the flame is the mind, the wind is scattered attention and the weak flame is torpor. In the early stages of the practice of concentration, the first of these disturbances is more common. The mind immediately flies away from the object to other things. This can be seen if we try to keep our mind on the memory of a face; it is immediately replaced by something else. It is very difficult to quell these disturbances because, over many lives, we have built up the habit of following them, while we have not developed the habit of concentration. We may find it very hard to develop new habits of mind and leave old ones behind, but concentration is the basic necessity for all higher meditation and for all kinds of mental activity. Mindfulness 26 and awareness consciousness 27 are the antidotes to scattered attention and torpor respectively. The drawing here represents an aspiring meditator, who is following the path of meditative stages that ends in the accomplishment of calm abiding and the beginning of the practice of insight meditation. At the bottom of the page we see the practitioner, who holds a rope in one hand and a hook in the other, chasing after an elephant led by a monkey. The elephant represents the meditator's mind; a wild or untrained elephant can be dangerous and wreak enormous destruction, but once trained will obey commands and do hard work. The same holds true for the mind. Any suffering that we have now is due to the mind being like a wild, untrained elephant. The elephant also has very big footprints; these symbolize the mental defilements. If we work hard at improving our mind it will be able to do very great work for us in return. From the suffering of the hells to the happiness of the buddhas, all states are caused by the behaviour of the mind. At the start of the path the elephant is black, which represents torpor or sinking of the mind. The monkey leading the elephant represents scattering of the mind. A monkey cannot keep quiet for a moment—it is always chattering or fiddling with something and finds everything attractive. In the same way that the monkey is in front leading the elephant, our attention is scattered by the sense objects of taste, touch, sound, smell, and vision. These are symbolized by food, cloth, musical instruments, perfume, and a mirror. Behind the elephant is a person, who represents the meditator trying to train the mind. The rope in the meditator's hand is mindfulness and the hook is awareness. Using these two tools the meditator will try to tame and control his mind. Fire is shown at different points along the path to represent the energy necessary for concentration. Notice that the fire gradually decreases at each of the ten stages of zhi.nay, as less energy is needed to concentrate. It will flare up again at the eleventh stage, when we start practising insight meditation. In the beginning, just as the elephant following the monkey pays no attention to the person chasing behind, the practitioner has no control over his or her mind. In the second stage, the practitioner, who has almost caught up with the elephant, is able to throw the rope around the elephant's neck. It looks back; this is the third stage, where the mind can be restrained a little by mindfulness. Here a rabbit is on the elephant's back, symbolizing subtle torpor, 28 which previously might have seemed to be a state of concentration, but now can be recognized for the harmful factor that it is. In these early stages we have to use mindfulness more than awareness. At the fourth stage the elephant mind is more obedient, so less pulling with the rope of mindfulness is necessary. 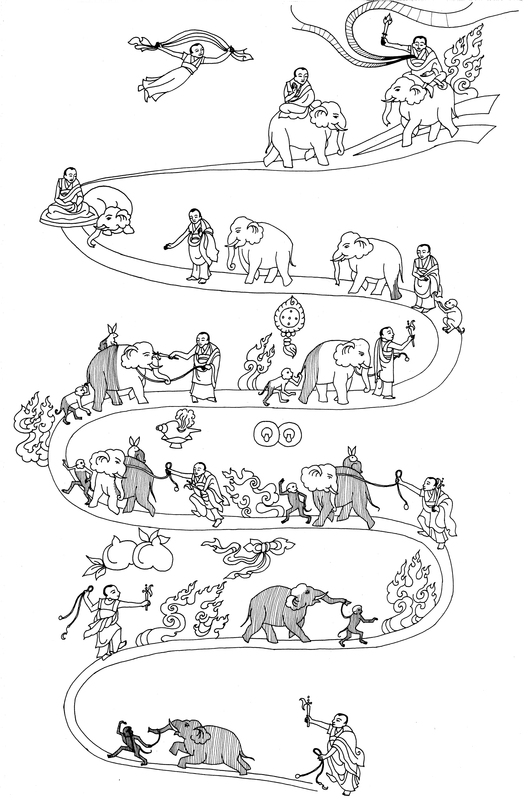 By the fifth stage the elephant is being led by the rope and hook and the monkey is following behind. At this point we are not much disturbed by scattering or distracted attention; mostly we have to use awareness instead of mindfulness. 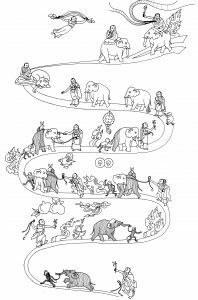 In the drawing, the sixth stage of practice is depicted with the elephant and the monkey both following obediently behind the practitioner, who does not have to look back at them. This means that the practitioner does not have to focus continually on controlling the mind, and the absence of the rabbit shows that the subtle torpor, which appeared at the third stage, has now disappeared. If we practise the calm abiding type of meditation, we might use an image of Buddha as our object of concentration. The first thing we do is look at it very thoroughly. Then we start meditating. In meditation we do not look at the object with our physical eyes but focus with the mind's eye. At first our memory of it will not be at all clear, but even so, we should not try to force it to become clear—this is impossible at the start. The important point is to keep our attention focused on it, clear or otherwise. The clarity will eventually come naturally. At the beginning, concentration is very difficult; the mind always turns this way and that. When we persist in the practice, however, we shall find that we are able to keep our mind on the object for one or two minutes, then three or four minutes, and so on. Each time the mind leaves the object, mindfulness has to bring it back. Awareness has to be used to see if disturbances are coming or not. If we carry a bowl full of hot water alone a rough road, part of our mind has to watch the water and part has to watch the road. Mindfulness has to keep the concentration steady, and awareness has to watch out for disturbances that may come. As we saw in the drawing, we need progressively less mindfulness after the initial stages, but then our mind, tired from fighting the scattering of attention, produces torpor. After a while there comes a stage where the meditator feels much happiness and relaxation, which is often mistaken for the true state of calm abiding; in fact, however, it is subtle torpor, which makes the mind weak. If we continue our practice with energy, this subtle torpor will also disappear. When we have removed this disturbance, our mind becomes clearer and more awake, and thus the object of our meditation is seen more clearly. As our perception of the meditation object increases in clearness and freshness, our body will be sustained by our peace of mind, and we shall not have hunger or thirst. Eventually, a meditator can continue like this for months at a time. The feeling experienced in the mind at this stage cannot be described. If we look at a piece of cloth with our eyes we can see it, bur not in great detail. But a person who has concentrated on it well with the mind's eye can see it very clearly in all details. When we die our mind becomes weaker, but if we practise meditation then our mind, at this time, will actually become fresher and clearer. Normally, dying people experience delusions and fears which lead to a bad rebirth. If, however, we have meditated well, then during the death process our mind will be concentrated on Buddha, Dharma and so forth; this helps very much for the next birth. The scriptures say that in the ninth stage of the practice of calm abiding, even if a wall crashes down next to the meditator, he will not be disturbed. As the meditator continues to practise, his body and mind experience a special pleasure; this feeling marks the attainment of the final goal of calm abiding. The meditator's body feels light and tireless, symbolized in the drawing by the person flying. His body has become very supple, and his mind can be turned to any meditation, just as a thin copper wire can be turned in any direction without breaking. The meditator feels as though the object and his mind have become one. Although at the ninth stage of calm abiding we feel very happy and peaceful, this is not the real end of meditation. Firm concentration on the object is still not the complete achievement. Now the meditator can combine concentration with an examination into the real nature of the object of meditation. After continuing the simultaneous practice of both types of meditation, a special pleasure arises from the seeing into the object. "Seeing the object" involves seeing whether an object is suffering, seeing if it is permanent or changeable, and looking for the highest truth to be found about the real nature of the object. In Tibetan, the name for this meditation with insight is lhag.thong; lhag means more, or higher, and thong to understand or realize. 29 Through this kind of meditation the mind obtains more understanding of the object than it can through simple concentration; when this practice has been perfected, the mind can turn to anything. The perfection of lhag.thong gives great spiritual satisfaction, but if one is satisfied merely with this, it is like having an aeroplane built, ready to fly, but left on the ground. The mind can be turned to deeper and higher things. It has to be used on the one hand to overcome karma and defilements, and on the other to obtain the virtues of a buddha. For this, the object can only be emptiness, or shunyata; other meditations prepare the mind for this final object. If we have a very good torch that can show up anything, we have to use its light to find what is important. The root cause of all our trouble is ignorance. We have to use our knowledge of emptiness to dispel ignorance; we must use our mind, purified by calm abiding and special insight, to cut the root of the tree of ignorance. In the drawing, at this stage, the practitioner is holding a sword, symbolizing the realization of emptiness, to cut the two black lines symbolizing the two obscurations: the defilement-obscuration and the knowledge- obscuration. The realization of emptiness is essential to remove ignorance. Once we come close to a thorough understanding of emptiness we are on the way to the perfection of wisdom—the complete comprehension of emptiness. Teachings about the four noble truths, bodhicitta, the five paths and ten levels, and the six perfections. Lama Je Tso ngkhapa has written: The development of an awakening mind (bodhicitta) is the framework of the Mahayana path and the foundation and basis of all the great waves of bodhisattva actions. Like an elixir that turns all metals to gold, it transforms all actions into the two collections (of wisdom and merit). It is a treasure of merit that accumulates limitless collections of virtues. Knowing this, the heroic sons of the conquerer, Buddha, adopt this jewel-like development of an awakening mind as their fundamental (practice). The following is an English rendering of the oral instructions of Geshe Rabten, a Tibetan lama who has been instrumental in bringing the pure teaching of Buddha Dharma to the West, making it clear, and causing it to increase and flourish. From the time of his own childhood, in Kham province, Tibet, Geshe Rabten Rinpoche had admired the Buddhist "monks in their maroon robes." At the age of eighteen, he left home to go to central Tibet where he entered the great Sera Monastery and began the twenty-four years of continuous study and personal hardship that would lead, in 1963, to the highest degree award of lharampa geshe. At Sera, while attending classes with his gurus and memorizing large numbers of root texts and related commentaries, Geshe Rabten Rinpoche spent most of his days, and nights, engaged in debate, the Tibetan learning method for honing the intelligence and deepening understanding. 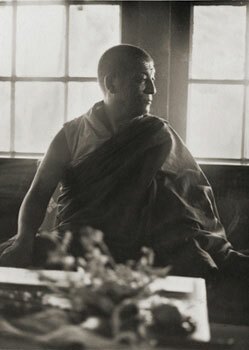 He thoroughly mastered the traditional curriculum leading to the geshe degree: basic logic, mind and its functions, and logical reasoning (pramana); general study of the perfections (paramita); specific study of the nature of existence (madyamika); ethics (vinaya); phenomenology (abhidharma); review of ethics and phenomenology (karam geshe level); and final review of the the great treatises (lharam geshe level—only the two best students per year are awarded the title of lharampa geshe). During this time Geshe Rabten Rinpoche also studied the graded path to the attainment of enlightenment via sutra practice and tantra. He has received many empowerments, first from the former incarnation of Gonsar Rinpoche, and later from His Holiness the Fourteenth Dalai Lama and his Senior and Junior Tutors, the late Ling Rinpoche and Trijang Rinpoche, and many other lamas. When, in 1969, a group of Westerners interested in Buddhism wanted teachings, His Holiness the Dalai Lama requested Geshe Rabten Rinpoche to instruct them, as His Holiness knew Geshe-la would be able to present to these students such teachings as the four noble truths and the entire path to enlightenment, clearly and effectively. Geshe Rabten Rinpoche remained in meditational retreat in the Indian Himalayas until 1974, when he went to Europe to conduct meditation courses. In 1975, at the request of his Western students, His Holiness the Dalai Lama sent Geshe Rabten Rinpoche to Europe again, this time to give sustained teachings on the Buddha Dharma. And in 1979, the monastic institute, Tharpa Choeling, was established near Mt. Pelerin, above Lake Geneva in Switzerland. At Tharpa Choeling, a monastic education based on Geshe's own at Sera is available to serious Western students. After Lord Buddha achieved supreme enlightenment he gave numerous sermons on the path to enlightenment, varying each teaching according to the mental state of the listener and the occasion. These teachings of the Compassionate One collected together comprise the three paths of Buddhism. Among the vast quantity of Buddhist scriptures are oral and written teachings that have been passed on from Lord Buddha himself, through Maitreyanatha, Asanga, Atisha and other great gurus up to the venerable Tsongkhapa, in an unbroken line. These particular teaching traditions have been carried on by the great Tibetan teachers so that we fortunate practitioners today still have the chance to be guided by them. 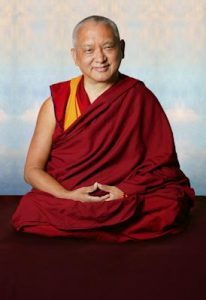 The Graduated Path to Liberation is an English rendition of oral instructions of Geshe Rabten Rinpoche, whose being and teachings radiate both wisdom and compassion. May this benefit all beings. 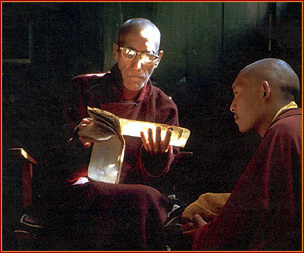 A teaching given to the monks and nuns of the International Mahayana Institute at Boudhanath, Nepal, 2 February 1975. Edited by Nicholas Ribush. For a translation of the root text, see Appendix 1 of His Holiness the Dalai Lama's Illuminating the Path to Enlightenment, or www.lam-rim.org. Translated by Lama Zopa Rinpoche. This teaching was published in 2005 in the LYWA publication Teachings From Tibet. Before listening to this teaching, first generate bodhicitta, thinking, “I want to receive enlightenment for the benefit of all mother sentient beings.” In other words, before listening to teachings, it is necessary to think of, to remember, all mother sentient beings. The subject today is Lam-drön, A Lamp for the Path to Enlightenment, which was written in Tibet by the great Atisha (Dipamkara Shrijnana), who was born about the year 982 in northeast India as the son of a Bengali king. Buddhadharma had already been established in Tibet before Atisha’s arrival there, but an evil king called Langdarma (Udumtsen), who was said to have horns growing from his head, hated the Dharma and caused it to degenerate in Tibet. But even though the teachings had been corrupted, they still existed—just not as purely as before. It took about sixty years to restore the teachings to their original purity in what became known as the later spreading of the Dharma in Tibet. But before Lha Lama Yeshe Ö could request Atisha to come from Vikramashila to Tibet, he needed to find gold to make a proper offering, so went to a place called Garlog in search of it. However, before he could accomplish his mission, the ruler of Garlog threw him in prison, where he died. In that way, Lha Lama Yeshe Ö sacrificed his life to bring Atisha to Tibet. Then his nephew, Jangchub Ö, sent emissaries to India to invite Atisha to Tibet. When he finally met Atisha, he explained how the Dharma had degenerated during Langdarma’s rule and how correct teachings no longer existed in Tibet, and requested Atisha to give the Tibetan people fundamental teachings on refuge, bodhicitta and so forth they were so ignorant. Therefore, Atisha wrote the precious teaching, A Lamp for the Path to Enlightenment. This text is based on the Prajnaparamita teachings of Shakyamuni Buddha and is the source of not only all the Gelug lam-rim teachings but also those of the other schools of Tibetan Buddhism, which all practice the graduated path to enlightenment and quote it in their teachings. After generating bodhicitta, as above, our main task is to attain enlightenment. Now, even though we might think that life in samsara is pleasant, it’s not. There is no true pleasure in samsara. Enlightenment can be attained only through the practice of Dharma. Therefore, we should all practice Dharma. In terms of teachings in general, there are two types: Buddhadharma and the teachings of the outsiders [Skt: tirthika; Tib: mu-teg-pa]2, which are based on mistaken beliefs, understandings opposite to those of Buddhadharma. By following such non-Buddhist teachings, you can be born anywhere from the lower realms to the peak of samsara, the highest of the four formless realms, but you can never escape from suffering. Within the Buddhadharma, there are also two divisions: Hinayana and Mahayana. By following Hinayana teachings, you can escape from samsara but you cannot attain enlightenment. To attain enlightenment, you have to practice Mahayana teachings. Within the Mahayana there are the teachings spoken by the Buddha himself and those written later by his learned followers, the eminent Indian pandits, including the six ornaments and the two supremes,3 and the great Tibetan masters. The teaching we are discussing here, then, is that written by the learned pandit Dipamkara Shrijnana, the Lam-drön. What is it about? It derives from the Maitreya’s Ornament for Clear Realization (Abhisamayalamkara) and explains the three levels of teaching: the paths of the practitioners of small, middling and supreme capacity, especially the latter. 1. The first verse includes three things. First there is homage to the Triple Gem: the buddhas of the three times, the oral teachings and realization of them, and the sangha—those who have received the unshakable, or noble, path. Second, he mentions that his pure disciple, Jangchub Ö, requested him to give this teaching. Third, he makes the promise, or vow, to write this teaching, this lamp for the path to enlightenment, the Lam-drön. 2. In the second verse, Atisha explains what he’s going to write about: the graduated paths of the persons of least, intermediate and supreme capacity, or capability. These are also the paths that Lama Tsongkhapa explains in his short, middle-length and great lam-rim teachings—the graduated paths of these three types of practitioner. 3. Of the three levels of follower, Atisha first explains the graduated path of those of least capacity. Such people think, “I don’t care what suffering or happiness I experience in this life; I must avoid rebirth in the lower realms and attain an upper rebirth.” With this in mind, practitioners of least capacity abstain from negative actions and practice virtue. 4. Persons of intermediate capacity develop aversion to not only the sufferings of the three lower realms but also to those of the three upper realms; to the whole of samsara. Such practitioners abstain from negative actions in order to free themselves from samsara, without much concern for other sentient beings. 20-21. The teachings explain that in order to practice engaged bodhicitta, we should take the bodhisattva ordination, but in order to do so we should hold one of the seven levels of pratimoksha ordination, such as gelong, gelongma, getsul, getsulma and so forth.4 Ideally, then, we should hold one of these fundamental ordinations before taking the bodhisattva vow, but the learned ones say that in general, those who avoid negative karma and create virtuous actions can actualize bodhicitta, even if they don’t hold any pratimoksha precepts. 23-24. First, the lama should know all about the ordination and how to bestow it. Furthermore, he should himself be living in the bodhisattva ordination and have compassion for the disciple. That’s the kind of lama we need to find from whom to take the ordination. But what if we can’t find a perfect lama like that? Atisha then goes on to explain what, in that case, we should do. 25-31. The Ornament of Manjushri’s Buddha Land Sutra explains how, long ago, Manjushri generated bodhicitta. This is what we can do. Visualize the merit field and all the buddhas and, in their presence, generate bodhicitta, the intention to attain enlightenment. Then promise, “I invite all sentient beings as my guest to the sublime happiness of liberation and enlightenment. I will not get angry or harbor avarice, covetousness, jealousy and so forth. I will not harm other sentient beings in any way. I will live in pure discipline by avoiding all negative actions, even worldly desires and sense objects of attachment, such as attractive sounds and beautiful forms and so forth. I shall give up such things. As all the buddhas have followed pure moral conduct, so shall I. 32-35. The best way to keep our three doors pure is to generate aspirational bodhicitta, engage in the practice of bodhicitta and follow the path to enlightenment. This depends on observing the three levels of moral conduct—the pratimoksha, bodhisattva and tantric vows. If we do this properly, we can complete the two collections of merit and transcendent wisdom. One thing that really helps us complete these two collections is the ability to foresee the future; therefore, we should try to acquire clairvoyance. Without it, we are like a baby bird whose wings are undeveloped and has not yet grown feathers and remains stuck in its nest, unable to fly. Without clairvoyance, we cannot work for other sentient beings. 36-37. The person who has achieved the psychic power to foresee the future can create more merit in a day than a person without this ability can create in a hundred years. Therefore, to complete the collections of merit and transcendent wisdom quickly, it is necessary to acquire the psychic power to see past, present and future. 39. In order to practice samadhi meditation properly, we must ensure that the conditions are perfect. If they are not, then even though we try practicing it hard for even a thousand years, we’ll never achieve it. Therefore, we should find a perfect environment, remain quiet and avoid having to do work such as healing the ill and making astrological predictions—any activity that keeps us busy. 40. The way to meditate to attain single-pointed concentration is to focus our mind on a virtuous object, such as an image of the Buddha. We visualize such an image in front of us and simply concentrate on that. As we focus our mind on the object again and again, we’ll be able to hold it for increasingly greater periods of time, and through the continuity of such practice will eventually attain calm abiding [Skt: shamatha; Tib: shi-né] and single-pointed concentration. Thus we will gain “higher seeing” [Tib: ngön-she], the psychic power to see the future and so forth. 41-43. But that is not the point. Next we have to practice penetrative insight [Skt: vipashyana; Tib: lhag-tong]. Without it, our samadhi cannot remove our delusions. In order to eradicate our two levels of obscuration—the obscurations of delusion [Skt: kleshavarana; Tib: nyön-drib] and the obscurations to knowledge, or omniscience [Skt: jneyavarana; Tib: she-drib]—we must achieve the wisdom realizing the non-self-existence of the I. Doing so also depends upon achieving method, such as compassion and so forth. It’s a mistake to practice only wisdom and not method. This can lead us to fall into individual liberation, or lower nirvana. Similarly, practicing only method and not wisdom is also a mistake and causes us to remain in samsara. 44-46. The Buddha taught that of the six perfections, the last of the six is the path of wisdom and the first five—charity, morality, patience, effort and concentration—are the path of method, or skillful means [Skt: upaya; Tib: thab]. First, we should meditate on method, then on wisdom, then on both together. By practicing both together, we can receive enlightenment; by practicing the wisdom of selflessness alone, we cannot. 47-49. Realizing the five aggregates [Skt: skandhas], the twelve sources and the eighteen constituents as empty of self-existence is recognized as higher wisdom. There is existence and non-existence: there is no such thing as the production of the existent, nor is there such a thing as production of the non-existent. There is no such thing as production of both the existent and the non-existent, nor is there production of neither the existent nor the non-existent. That is one form of logic negating the production of both the existent and the non-existent. There is also another form of logic negating production of a thing from self, other, both or neither—the four extremes. The main thing to discover here is non-self-existence. That can be found through the first line of logical reasoning, which negates production of the existent and the non-existent, and through the second, which negates production of the four extremes. 50-51. It can also be discovered through a third line of reasoning that examines things to see whether they are one or many. These lines of reasoning are elaborated by Nagarjuna in his Seventy Stanzas on Emptiness and in other texts, such as his Treatise on the Middle Way. 55-58. Since this world is created by superstition, or conceptuality [Tib: nam-tog], if we eradicate the creator, superstition, we can attain liberation. The Buddha said that it is superstition that causes us to fall into the ocean of samsara. Therefore, that which is to be avoided is superstition, but the emptiness of superstition, which is like the sky, like empty space, is that which is to be practiced. By achieving this, we will be able to see the absolute nature of existence. Therefore, the bodhisattvas’ practice is to avoid superstition and thus to achieve the non-superstitious mind. Through the various different means of logic—by realizing the emptiness of the produced and of inherent existence—we can avoid superstition and achieve the wisdom of shunyata. 59. Then we can also attain the different levels of the path of preparation [Tib: jor-lam], the second of the five paths. We attain the four levels of this path and gradually the ten bhumis [Tib: sa], or bodhisattva grounds, as well. Finally, we attain the eleventh level, enlightenment itself. 60-67. Having realized shunyata, we can also gain the general realizations of tantra, such as the four powers of pacification, wrath, control and increase, and other attainments, such as “accomplishing the good pot.” Accomplishing the good pot means doing a particular meditation in retreat for a long time and, if we are successful, gaining the ability to just put our mouth to the opening of a pot and say something like “May I become the king of this country” and have our wish fulfilled. Or we can gain the tantric power of the “eye medicine.” If we accomplish this, just by applying a special ointment to our eye we can see things precious substances such as gold, jewels and so forth even hundreds of miles beneath the surface of the Earth; no matter how far away they are, we can see them. Through the practice of tantra we can receive enlightenment without having to undergo many great austerities. The tantric way to enlightenment is through happiness; other paths to enlightenment are through hard, austere practice. There are four different levels of tantra: Action, Performance, Yoga and Highest Yoga Tantra. First we have to receive initiation. In order to do so, we have to make material offerings, such as gold or even members of our family—a spouse or a sibling— and with great devotion request our guru to give us the initiation.6 If he is pleased, out of his compassion he will then give us the initiation. Having taken it, we also receive the great fortune of being able to attain enlightenment and all the high realizations that come with it. In Highest Yoga Tantra there are four different initiations: the vase, secret, transcendent wisdom and word initiations, the latter being where the guru imparts clarification, or proof, through verbal explanation. However, the secret initiation should not be given to those living in ordination. If monks, for example, take the secret initiation, they have to leave the monastic order, because those who have taken the secret initiation are required to practice with a female consort. If they do these practices without first returning their ordination, they lose it, the consequence of which is rebirth in hell. To receive tantric commentaries, you first have to receive initiation. Without initiation, you cannot receive tantric teachings. You also cannot perform fire pujas [Tib: jin-sek] or give tantric teachings. 68. In the last verse, Atisha closes this text by describing himself as an elder [Tib: nä-tän], a full monk who, in the first twelve years after taking ordination, hasn’t created any moral falls; a senior full monk. He states that he has given this brief explanation on the steps of path at the request of his noble follower, Jangchub Ö. Every lam-rim teaching ever written refers back to this text, A Lamp for the Path, irrespective of the Tibetan Buddhist tradition—Nyingma, Kagyu, Sakya or Gelug. Where does the Lamp itself refer back to? That is to the Buddha’s prajnaparamita teachings. In terms of prajnaparamita texts, there are elaborate, intermediate and short, but the author of all of them is the Buddha. Therefore, all lam-rim texts have their source in the teachings of the Buddha. If you want to understand the lam-rim well, you should study it as extensively as possible. When you understand the lam-rim well, you will understand the Lamp for the Path. Once you do, you should teach it all over the world. There are many aspects of the Mahayana tradition, but in general, it contains great knowledge. The main thing, however, the fundamental thing, is concern for others, working for others, benefiting others. Followers of the Hinayana are mainly concerned about only their own samsaric suffering—in order to escape it, they follow the path of the three higher trainings: higher conduct, higher concentration and higher wisdom. There are many ways to explain how the Mahayana is different from and higher than the Hinayana, but the main difference is that Mahayana practitioners are more concerned with working for the welfare of others than their own. People nowadays might think of helping other people, but Mahayana practitioners benefit not only other people but also suffering hell beings, pretas, animals and every other sentient being. There is not one sentient being who has not been our mother—all sentient beings have been our mother numberless times—therefore we should be concerned for their welfare, wanting them to become enlightened as quickly as possible. This, then, is the fundamental difference between the Hinayana and the Mahayana, this concern more for others than oneself, in particular, the wish to enlighten all sentient beings. That’s what makes the difference. It is excellent that you are studying the vast and profound teachings of the Mahayana, thinking about them, analyzing them intently, and you should continue to do so. In general, there are many religions and everyone thinks that the teaching of his or her own religion is the best. But just saying that one’s own religion is the best doesn’t prove it’s the best; that doesn’t mean anything. Therefore, simply saying that Buddhadharma is the best religion in the world doesn’t make it so. However, there are many logical reasons you can use to prove that Buddhadharma is, in fact, the best. For example, even accepting and practicing bodhicitta is very different from not accepting and practicing bodhicitta. Even in this, there’s a big difference between Buddhism and other religions; the fact of the presence of the practice of bodhicitta shows that Buddhism is higher than other religions, that Buddhism is the best. Buddhism also talks about dependent origination and emptiness; it explains dependent origination as it exists, right there. So, not only in conduct but also in view, Buddhism is very different from other religions and therefore the best. There are many ways to prove this. However, Buddhadharma is something that the more you study it, the deeper it becomes, the more profound you find it to be. This is a quality unique to Buddhadharma. With other teachings, the more you study them, the lighter they become. There are many countries, such as Vietnam, where Buddhism existed for centuries, but none were like Tibet. In those countries there existed only one aspect of the Buddhadharma, not all; but in Tibet, all aspects of the teaching existed—Hinayana, Sutrayana and Vajrayana. In order to study all this, you should learn the Tibetan language, study its grammar, and follow your lama properly. Please, don’t offer me anything. I have enough to eat and drink; that’s all I need. The reason I have given you this teaching is not to receive something but for you to practice purely. I’m not building monasteries or making offerings to statues and so forth so I have no need for money. I accept offerings only when I lack something. When I have enough, I don’t accept offerings, especially not from monks or nuns. My idea of wealth is different. Otherwise, teaching and taking money is a bit like making business. For now, I just want you to practice, but if things get bad and I don’t have enough to eat or drink, then maybe I’ll accept something. 6. These days, initiations seem a bit easier to come by. This talk was extracted from the FPMT Education Department's Discovering Buddhism at Home readings, Module 8, "Establishing a Daily Practice." It was taken from Liberation in Our Hands, Part II, Appendix F: "How to Meditate on the Stages of the Path to Enlightenment”, by Pabongka Rinpoche, pp. 323-344. Original translation by Art Engle. Reprinted with permission from Mahayana Sutra and Tantra Press. In response to a written request from Dragom Choktrul Rinpoche of the Shodo Monastery in Kham, the incomparably beneficent, glorious and kindhearted one, the Supreme Savior Dorjechang Pabongkapa Dechen Nyingpo, composed the following work unexpectedly and at a time when he was extremely busy and faced with many responsibilities. What is included here are the instructions on how to gain the realizations from Relying on a Spiritual Friend through Refuge. And those of his lineage of spiritual sons. It is because we lack the analytic meditation that combines understanding with experience. Can generate both strong faith and listening wisdom2 about the topics of leisure and fortune, Impermanence, aversion,3 and so on; but they have not arisen through analytic meditation. Such wisdom is nothing more than right judgment4 and so eventually it fades away. So apply yourself to the profound method for avoiding insensitivity to dharma. Along with your own efforts to listen to dharma properly. To generate soon afterward the understanding which comes from reflection. How, then, do you generate the understanding which comes from reflection? And in every way, using scriptural citations and sharp reasoning. For this is the means of eliciting the conviction that he is a Buddha. Practicing this strenuously and repeatedly is what we refer to as analytic meditation. Is to elicit sure understandings of them by engaging in sharp analytic meditation. And you will have firmly planted the roots of your spiritual experience. So train yourself skillfully in the ways of analytic meditation. Moreover, analytic meditation is a unique quality of our system. Outside the range of our Jamgon Lama’s7 enlightened speech. Are taught in the Great Stages of the Path to Enlightenment [Lam-rim Chen-mo]. That they represent an extraordinary quality of our teaching system. This is not what we call cultivating analytic meditation. And then rehearse their meaning in your mind. Is also just reflective mediation, not analytic meditation. As the means of generating a sure understanding. An object of attachment, and it increases our active desire. Has harmed us, our hatred greatly increases. And it ignites our “experiential awareness” of hatred. The various reasons that will elicit them, as I just described with desire and hatred. For eliciting a spiritual transformation within your mind. This is a sign that you are succeeding; so continue striving. And your mind remains unmoved, this means your practice is not succeeding. It’s also a forewarning against becoming insensitive to dharma. And remove obstacles.9 Then try again to cultivate the meditation topics effectively. Impermanence, renunciation, and so on, even without having practiced meditation. They become joyously enthusiastic, thinking these are true spiritual realizations. We see that they become saddened at the loss of these sentiments. Of transitory perceptions; they aren’t true spiritual realizations. When such feelings arise or become dejected when they fade. From your guru and tutelary deity, you should strive to make them firm. Which come forth in succession after meditating continuously with wisdom’s discerning power. These represent inferential knowledge and, unlike the feelings mentioned earlier, they never fade away. Moreover, you must learn the skillful technique for eliciting realizations. From serving a spiritual teacher to generating enlightenment mind. Do so just long enough to become proficient in each of them. Enlightenment mind, in order to elicit contrived experiential realizations. Then do the same again, in order to elicit uncontrived experiential realizations. That you know how to meditate on them and that you are able to generate the realizations, we call this becoming proficient. Without such reflection, is called a contrived experiential realization. That arises in your mind without any need of prolonged contemplation. This marks the first dawning of spiritual realization. They can be generated even after practicing for only seven days or so. For other topics, the realizations arise after several days or weeks. For still others, they are difficult to generate even after a year or more. But the uncertainty of the time of death is very hard to realize. At the time of death. Such differences hold true for the other topics as well. For which realizations come easily; instead, move on to the next point. Continue meditating until you generate the appropriate realizations. And those later ones for which you have yet to gain realizations. So focus single-mindedly as you analyze and contemplate the one topic you are currently practicing. And how should you apply analytic meditation to it? Of analytic meditation should begin with the topic of how to serve a spiritual teacher. Which is extremely important but also difficult to realize. Until you succeed in eliciting a mental transformation. Your practice will become reflective meditation, not analytic meditation. Therefore, during each period contemplate just one topic. The first of the four in this section14—the only one you wish to verify. This very topic for the entire period until you generate a sure understanding. Just as on the first day, cultivate this topic the next day and the next day after that. Cultivate it for a month and for a second month as well. Continue practicing this way until you elicit the true experiential awareness. When the experiential awareness emerges, switch to the next topic. After you have realized a topic, contemplate it with reflective meditation alone. The later topics cannot be realized before the earlier ones. That a guru is the agent for all the Buddhas’ activities. That even nowadays all Buddhas act on behalf of sentient beings. Meditate by applying the intense analysis of scripture, reasoning, and your guru’s instruction. Until you succeed in eliciting the proper experiential realization. Than all the others, devote yourself to it with great effort. Cultivate it by intensely applying the technique of analytic meditation. You have generated the realization that relates to serving a spiritual teacher. You should briefly contemplate as well the topic of pleasing your guru through action. Ranging from leisure and fortune to generating precious enlightenment mind. Are difficult to generate without practicing for months or even years. So that you can make progress quickly in gaining experiential realizations. Devote one period of each day to the subject of serving a spiritual teacher. Meditate on the topics in the manner that was described above. Leisure and fortune, by analyzing them according to the established order. First, this will further your realizations about serving a teacher. By the time you complete the subject of serving a spiritual teacher. And you can enjoy the fruit of all three at the same time. Therefore, divide each day’s meditation periods into three parts. And during one part apply analytic meditation to the profound view. The way to contemplate serving a spiritual teacher is as I explained before. Is first to identify what the essence of leisure and fortune is. And how fortunate you are not to have been born there in this life. So that you will imbue yourself with a deep awareness of how you currently possess them all. Then you have generated the realization of identifying leisure and fortune. And repeatedly scrutinize it with the subtle analysis of scripture and reasoning. When you become distressed if even an instant of time is vainly spent. Leisure and fortune, and reflect on it with powerful analytic meditation. Then you have realized the difficulty of finding leisure and fortune. Turn now to the meditation topics that relate to impermanence. And then for another week or so on the six advantages of recalling death. After that, practice the three reasons that death is certain. Apply analytic meditation to this topic no matter how many days or months it takes. Is that your life span does not increase and is constantly growing shorter. Cultivate it by practicing analytic meditation forcefully. To practice dharma even during the time you remain alive. Through it, recollection of impermanence can be generated easily. This topic is placed after the set of nine points20 for meditating on death. Consider what the various stages in the dying process will be like. By meditating on this, you will feel a sense of overwhelming terror. You will be so dismayed that you cannot stay on your meditation seat. This is the measure that you have realized the certainty of death. There is no certainty that your death will not come this very moment. From every standpoint and in every way. About how to recollect that the time of death is uncertain. You see and hear directly about the uncertainty of other persons’ lives. Death strikes by means of many causes, suddenly and unexpectedly. Some persons die while they are walking. Some die while they are eating, others while talking. Some persons die while laughing, others while they are running. Some who are strong and agile die performing athletic feats. One moment they are persons; the next they are corpses. One moment they are alive; the next they are gone. Will grip you in his jaws and then crush you with his fangs. And that you can’t be sure he won’t kill you right now. Are many while the factors that sustain life are few. How your body and life force are as fragile as a water bubble. Then you’ve generated the realization of the uncertainty of death. Realization of the certainty of death comes with relative ease. However, it’s more difficult to realize the uncertainty of the time of death. So don’t think to yourself that the latter topic is taking too long. Continue with your practice for days, months, or even years. Meditate with single-minded resolve until you produce a mental transformation. That nothing except holy dharma can benefit you at the time of death. That neither friends, nor wealth, nor body are of any help. No further practice is needed; for this very understanding is the measure of realization. A key point is to go on to the next subject after you have gained the proper awareness. Right after reflecting on each aspect of the lower states. Separately from the act of taking refuge. Of experiential realization, you should cultivate the two practices jointly. The suffering of “Revivals”, which is the first of the hot hells. Contemplate its sufferings as though you are really experiencing them. That have the power to hurl you into the Revivals hell. In the limb called “being,”25 you will definitely fall into that place. What will you do when you are actually born there? Contemplate how you will manage to endure suffering like that. Contemplate how you will manage to bear such a long life span. That you have actually been born there and that you are certain to be born there. An experiential awareness of the suffering in the lower states. To the four great adjacent hell regions and the eight cold hells. Don’t reflect as though you were watching some remote spectacle. Will penetrate your heart as before, and cause you to lose all contentment. That can save you, this is the mark that you have generated the proper realization. Recalling this again and again is the best way to improve your practice. That you have actually become each type of hungry ghost and animal. That will surely cause you to be born there before very long. Or as a dog, a donkey, a worm, a bird, a deer, and so forth. And animals as described in the Sütra on Well-composed Recollection. You will also develop the desire to find a refuge that can save you from this plight. Is the only true refuge and to reflect on their various qualities. On the four reasons that explain why they are a worthy object of refuge. After that, meditate on a Buddha’s physical, verbal, and mental qualities, and on the qualities of his activities. Such as the two Ornaments, the Higher Science,28 and the like. The measure for having generated the proper experiential realization is to develop an intense faith that cannot be reversed. That is, our teacher, his teaching, and those who practice the teaching. Associated with each aspect of the Triple Gem. How to take refuge by professing faith in the Triple Gem. Because no other teacher, refuge, or followers are their equal. Is to take refuge by disavowing faith in any other tradition. Are inferior in that they possess six opposite distinctions. And how no other tradition whatsoever is a true refuge. Even the slightest thought of wanting to take refuge in someone else. On the precepts to be observed. So exert yourself with heartfelt conviction. Study and reflect on the explanations found in the major scriptures. As numerous as the grains of sand in the Ganges, and as deep as the ocean. By recognizing and developing faith toward even a portion of them. So devote yourself to this practice earnestly and vigorously. You should practice taking refuge in a way that combines the two subjects. And the faith which believes that the Triple Gem alone have the power to save you. To the Triple Gem as the object which can save and protect you. To find a refuge, nor would you even know how to take refuge. Thus, it’s crucial that you begin right now to practice taking refuge. A complete object of refuge, which becomes seated in front of you. Then visualize all sentient beings of the six classes surrounding you. After that, begin by meditating on the suffering of Revivals. Imagine you are actually there, so vividly that it fills you with terror. Possess the power that can save you from this plight. The refuge formula aloud many times over. The eight cold hells, the hungry ghosts, animals, and so on. Meditate on all their various sufferings, taking each one separately. Then recite the refuge formula aloud, after you have contemplated each topic. These key points make for a practice that is truly wonderful. Nowadays, many persons recite the refuge formula a prescribed number of times. Such practice is mere verbal striving, mere words, mere counting. How could this ever represent a genuine form of taking refuge? To the inner faith of Buddhism and which is performed as though it were a form of punishment? This will ensure that your efforts are carried out most effectively. 1. Concern with experiencing pleasure and pain, concern with material gain or not getting, concern with receiving praise or blame, concern with experiencing agreeable sounds, etc. and disagreeable. 2. This is a reference to the first of three levels of wisdom – derived from listening. The other two are wisdom derived from reflection and wisdom derived from meditation. Wisdom derived from listening only represents correct judgment; therefore, it is not knowledge in the epistemological sense. Moreover, as the text notes later on in this section, the main purpose of analytic meditation is precisely to generate the second type of wisdom, that which is born of reflection, because this does represent knowledge—more specifically, inferential knowledge. 3. That is, aversion for the defects of samsaric existence. 4. Traditional Buddhist epistemology defines seven types of cognitive awareness. Only two of these—inference and direct perception—have the capacity to represent knowledge. The other five, including right judgment, do not. 5. This is a condition which occurs when a person gains some learning of the dharma but fails to put it into practice. As a result, his mind becomes hardened to the dharma and he fails to achieve any spiritual self-discipline. 6. The “former awareness” is the wisdom which derives from listening; the “latter” is the wisdom which derives from reflection. 8. shar gom. While reflective meditation represents a valid form of practice, it is important to distinguish it from analytic meditation. The point being made here is that only analytic meditation represents the true method for generating uncontrived experiential realizations. 9. Examples of acts that accumulate merit are making offerings, rejoicing at one’s own virtue and that of others, and so forth. Two practices that remove obstacles are confession and making prostrations. 10. That is, after having listened to Lam-rim teachings and studied related texts, but without having practiced analytic meditation. 11. These are the first three divisions of the Lam-rim teaching: (1) the greatness of the origniator of the dharma teaching, (2) the greaness of the dharma teaching itself, and (3) the correct method of listening to, and teaching, the dharma. 12. The six preliminary practices are: (1) Cleaning the place and setting up the altar, (2) Arranging well-obtained offerings, (3) Positioning oneself and generating refuge and bodhicitta, (4) Visualizing the field of merit, (5) Offering a 7-limb prayer and mandala, and (6) Making requests. 16. This topic should be pursued in a third period of each day. See next paragraph. 17. Renunciation, enlightenment mind, and the correct view. 18. The eight inopportune conditions are: being born as a hell-being, craving spirit, animal, in a barbaric country, as a long-living god, with imperfect senses, having wrong views, or when a Buddha has not come into the world. 19. You can find this in Pabongka Rinpoche's Liberation in the Palm of Your Hand, pages 133-138. 20. The nine reasons that are included in the three root categories. 21. That is, after contemplating the three reasons associated with the certainty of death. 22. This poem is called Heart Spoon: Encouragement through Recollecting Impermanence, available from the FPMT Education Department or Wisdom Publications. 23. Like the first root category, the second is also comprised of three reasons: (1) the life span of a person in the Jambudvipa is uncertain, (2) the factors that contribute to death are many and those that sustain life are few, (3) our bodies are extremely fragile. 24. Roasted barley flour, a common staple food in Tibet. 25. This is the tenth limb of the twelve-part teaching on dependent origination also commonly referred to as “becoming”. 26. These are the seven remaining hot hells. 28. Ornament of Realizations (Abhisamayalamkara), Ornament of Mahayana Sutras (Mahayanasutralamkara), and Treatise on the Higher Science of the Mahayana (Mahayanottaratantrasastram). 29. The six are (I) a Buddha is without faults and has fulfilled all virtuous qualities; (2) a Buddha’s teaching bestows the fruit of happiness through a path that is easy to traverse; (3) the teaching enables you to move against the flow of samsara‘s current; (4) the teaching removes the mental afflictions; (5) the teaching does not deceive those who seek liberation; and (6) the teaching is singularly virtuous and enables you to eliminate faults. See Great Stages of the Path to Enlightenment [Lam-rim Chen-mo] by Lama Tsongkhapa. 30. A particular group of religious practitioners. 31. Guide to the Bodhisattva’s Way of Life, Chapter 2, verses 45-53. 32. That is, the appropriate occasion for carrying out such a practice is when you have reached this stage in the Lam-rim teachings.